LADIES, I owe you an apology. You see, I didn't start a Royal Navy reenactment group to create programing for women or to do research on women in the early 19th century. We worked hard to recruit the best guys we could find and to create naval programing for them, but left you gals with nothing to do when you attended an Acasta event with your husbands and sweethearts. I'm sorry, it was never my intention to exclude you, but to be honest, I was never really sure what to do with you! I always had my hands full with programing for the guys. Going forward, we're going to take some steps to try to fix that. To that end, we're going to start a "Wives & Sweethearts Auxiliary" for you ladies of the Acasta. This parallel group will run in a very similar fashion to the Acasta herself, it'll have clothing standards (just like the sailors) and offer period appropriate programming (just like the sailors) that will entertain and educate the public while at events, as well as the individual members of the "Wives & Sweethearts Auxiliary itself. It'll need a knowledgable and energetic leader, therefore I have decided that that leader will be Christina Johnson! Christina is an amazing researcher who is extremely well versed in women's clothing and roles in the era we portray, and she has tons of fun interp ideas in mind. Christina has over 15 years interpretative experience working with a variety of historic sites, not for profits, and museums. She's a professional educator with a masters certificate in educational research and technology. 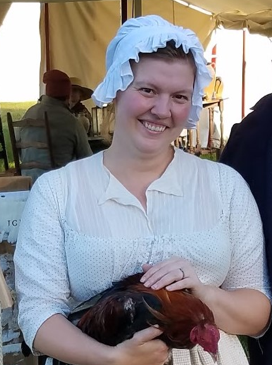 She's developed and implemented volunteer interp training programs for two museums in and around her hometown and she presents workshops and lectures in the museum field several times a year. I'm very excited about this new endeavor! I am very pleased to be able to offer programming to a segment of our population that has been unserved until now! For the past few weeks, Christina has been hard at work on the new Acasta WSA website, and as of today it's open for business. It's still early days, but I have no doubt that with time and the encouragement of you the readers, it will flourish. In additon, you may find the new link at the top of the site with the buttons that lead to our various pages. ENJOY!